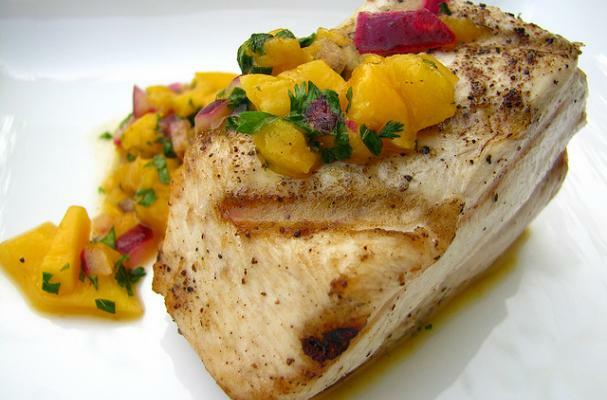 I don't know what's better in this dish: the fresh tuna or the mango salsa? The fresh-from-the-sea albacore tuna loin we purchased stayed so moist and tender during grilling, often times a fish that easily dries out. What perfectly topped it was the mango salsa. The sweetness of the mango balanced beautifully with the fresh cilantro, onion and lime juice. It's also a great addition to grilled pork or chicken. Drizzle olive oil over loin or steaks and season on all sides with salt and pepper. Grill on medium-high until preferred doneness. In a bowl, combine the above ingredients. If the mango is firm, mash the chopped pieces a bit with a fork. We are having albacore for dinner tonight, and I just happen to have a mango and some cilantro, so thanks for the great idea of the mango salsa. What a great summer dinner with a salad of fresh lettuce and arugula just picked from the garden. Thanks again for another great dinner recommendation. I love making mango salsa. It's so refreshing. Love the picture. Gorgeous! I love that combination too. Why are simple recipes with just a few ingredients so satisfying? Every once in a while, I toss some chopped peanuts into this salsa - adds a great crunchiness to it. Nice, I like the chopped peanuts idea. very nice. I just love grilled tuna. After checking with chiff0nade, my assistant at the CassandraCrossing (she is also a Senior Adviser at Serious Eats website), we have decided to recommend this recipe to our entire group of ladies at the Crossing. I'm quite certain they will be impressed. By the way, Louise ("therealchiffonade") is VERY particular about which recipes we recommend on our famous website. Nice recipe! I'm a huge mango fan and a huge tuna fan. I love how summery and healthy this looks.